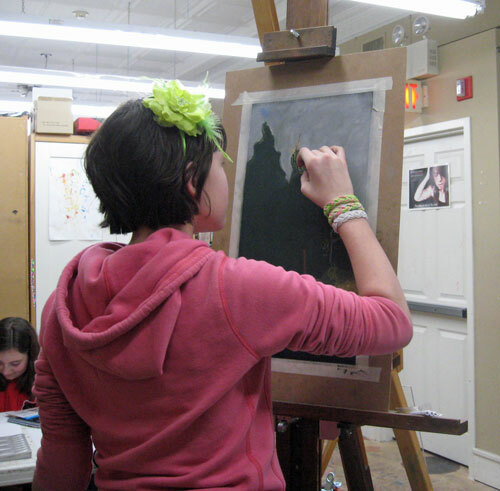 ArtFusion offers a wide variety of multi-week classes as well as one- and two-day workshops. We invite you to come and get inspired! Click here to see our current schedule of classes. Most of our classes require a minimum number of students in order to run. If that minimum has not been met one week before the scheduled start of the class, the class will be cancelled. So please register early to avoid disappointment! ArtFusion admits students of any race, color, national origin, and ethnic origin to all the rights, privileges, programs, and activities generally accorded or made available to students at the school. It does not discriminate on the basis of race, color, national origin, and ethnic origin in administration of its educational policies, admission policies, scholarship and loan programs, and other school-administered programs. Your online order made through our website will be processed through Square. You can use the credit or debit card of your choice. (Please note: we no longer accept credit cards over the phone. As an alternative, we can email you an invoice that you can pay online with a credit or debit card.) You may also pay by check, cash or credit card at our 341 Beech St. location. Questions? Please call or email us. In the event the building fire alarm is triggered, all students and staff will immediately exit the building and gather in the parking lot of the former Medicine Shop building (corner of Charlotte and Beech St.) We will only reenter the building when it has been cleared by local fire department personnel. If we need to leave the immediate area due to an active fire or other emergency situation, our evacuation location is the corner of Lincoln and Charlotte streets, about one block away from the school. If we need to leave ArtFusion grounds, we will notify parents immediately. You may register in person, on our website or over the phone. Full tuition must be paid at the time of registration. (Please note: we no longer accept credit cards over the phone. As an alternative, we are able to email you an invoice that you are able to pay online with a credit or debit card.) Make checks payable to: ArtFusion 19464. There is a $25 charge on returned checks. Your full payment confirms class registration unless notified by ArtFusion. To secure placement in class, we recommend registering early. We reserve the right to cancel classes due to low enrollment. In case of cancellation, all students will be notified by email and/or phone. Adult, teen and children’s supplies are included unless otherwise stated. ArtFusion offers scholarships to those who demonstrate financial need. Please click here to download an application. We will notify all registered students in the event of class cancellation by ArtFusion, and full refunds will be issued. Please note that during snowy weather, we normally follow closings and delays for the Pottstown School District. Any changes to our regular hours and schedule will be posted here on our website and on social media. In addition to class tuition payment, each student is required to fill out a registration form before attending class. Click here to fill this form out online. A $15 processing fee will be charged on all refunds (unless class was cancelled by ArtFusion), for students who cancel one week prior to class start. Up through the second week of class: 75% of the tuition less the $15 processing fee will be refunded. No refunds for one or two day workshops will be issued. Membership fees are non-refundable. ArtFusion does not pro-rate any class due to late registration or missed classes. Extreme circumstances can be made in writing and forwarded to the director. Gift some creative fun. Our gift certificates can be purchased for any dollar amount and can be used for gallery merchandise or classes–it’s their choice! Paper gift certificates are available at our 341 Beech St. location, or we would be happy to create a pdf version that can be emailed to your recipient. Click here to purchase a gift certificate online.